(Nanowerk Spotlight) Two-dimensional (2D) nanocrystals offer exciting opportunities for both fundamental studies and many technological applications due to their unique and fascinating properties. Transition metal oxide (TMO) nanomaterials have been widely studied as electrodes for alkali-ion storage, because they generally exhibit improved capacity and rate capability compared with their bulk counterparts due to the abundant active sites and the shortened ion diffusion distance. However it is critically challenging to synthesize TMO nanosheets with confined thickness as they are intrinsically non-layered materials that can’t be exfoliated to form nanosheets as conventional layered materials do. In the literature, TMOs are mostly studied in the form of 0D nanoparticles, 1D nanotubes and nanowires, and 3D nanoclusters or microclusters. There are very few reports studying the 2D nanostructured TMOs, not to mention those with confined thickness. Most TMOs are intrinsically non-layered materials, which cannot be mechanically or chemically exfoliated to form 2D nanostructures via the conventional exfoliation method. Therefore, a general and facile bottom-up strategy for the controlled synthesis of 2D TMO nanostructures is needed. In new work, a research team from The University of Texas at Austin and Argonne National Laboratory, now has developed a general synthesis strategy by employing graphene oxide as a sacrificial template to prepare various 2D holey TMO nanosheets, including mixed metal oxides and simple metal oxides. 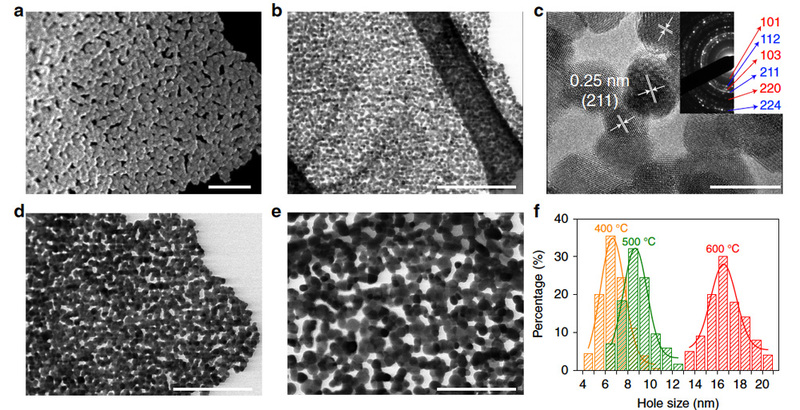 The team reports their findings in Nature Communications ("Holey two-dimensional transition metal oxide nanosheets for efficient energy storage"). "The most exciting results of our research are that we develop a general sacrificial-template strategy for controlled synthesis of holey TMO nanosheets with tunable pore sizes for improved alkali-ion storage properties," Guihua Yu, a professor in Materials Science and Engineering, Mechanical Engineering, at the Texas Materials Institute, University of Texas at Austin, tells Nanowerk. "This approach is universal for the synthesis of various 2D holey TMO nanosheets including mixed transition-metal oxides and simple oxides. This unique holey structure can minimize the restacking of 2D nanosheets and provide more active sites for alkali-ion storage." 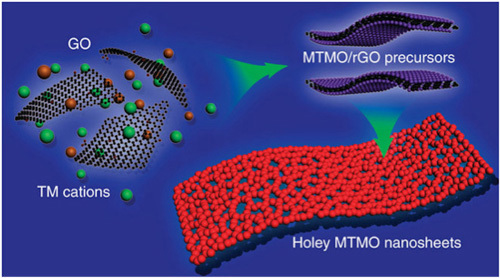 The researchers show that 2D holey TMO nanosheets composed of chemically interconnected metal oxide nanoparticles inherit the strong mechanical properties from graphene oxide, maintaining the holey morphology and displaying minimal structural changes during the lithiation processes. The team's results show that the 2D holey nanostructured TMO materials are a promising material platform for improving electrochemical performance because of the synergistic effects of the structure-derived excellent chemical/mechanical stability and the enhanced charge transport properties. The general strategy reported in this work will provide guidance for the synthesis of other 2D holey nanosheets materials, as a unique material platform for advanced energy storage and conversion devices, and can be extended beyond oxides, to phosphides, sulfides and selenides. The researchers demonstrated that the hole size of 2D holey oxide nanosheets can be readily adjustable by tuning the thermal annealing temperature, and the precursor ratio, etc. Compared to other nanostructure forms and bulk particles, these nanosheets exhibit significantly enhanced charge storage and transport properties. "Our general method represents a promising bottom-up strategy to synthesize 2D TMO nanosheets materials from those with intrinsically non-layered structures," Yu points out. "In addition, advanced in situ TEM characterization shows that the 2D holey ZMO nanosheets inherit strong mechanical properties from graphene oxides, displaying minimal structural changes during the lithiation/delithiation processes and even under mechanical pressing states." "Moreover" he continues, "Operando XRD and XAS results show that holey ZMO nanosheets deliver high capacity due to the formation of ZnLi alloy as well as the reversible transformation between Mn2+ and Mn3+. This also provides valuable guidance for the fundamental understanding of electrochemical reaction of these oxide nanomaterials in batteries." As the team explains to Nanowerk, the implications of this work are two-fold. First, a general synthetic strategy is developed by employing graphene oxide as a sacrificial template to prepare various 2D holey TMO nanosheets, and it can be extended to other materials system beyond oxides. 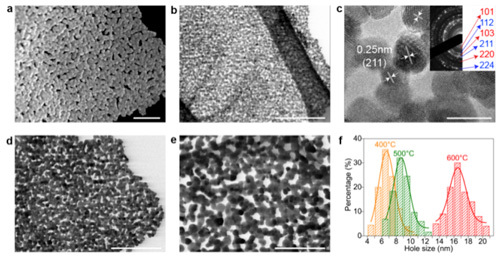 Second, given potential merits of 2D nanostructures including tunable porosity and inherently strong mechanical stability, these 2D holey nanosheets could be promising candidates for emerging applications in energy storage and conversion systems, and electrocatalysis. Following up on these research results, the scientists are continuing to explore the general synthesis of holey nanosheets in other material systems, such as phosphides, sulfides and selenides. Moreover, they are starting to explore some other promising applications in energy technologies, such as electrocatalysis. "We think that future directions will be focused on extending the general method to synthesize holey nanosheets in other material systems, such as phosphides, sulfides, selenides, maybe even phosphates and sulfates," says Yu. "One critical challenge is the controlled deposition of metal ion precursors on the graphene oxide template and the following thermal annealing treatment, as the deposition of precursors on graphene oxide for different materials are certainly variable. Substantial efforts need be devoted to exploring the optimal material systems, reaction precursors and the thermal treatment conditions." "But" he concludes, "we believe this proposed general strategy may open up a promising avenue for designing 2D nanostructures for versatile materials, especially those with intrinsically non-layered structures, for broad applications in nanoscience and nanotechnology."